We are supported by a state-of-the-art processing facility that is spread over a wide area. The unit is hygienically maintained and manned by our team of experts to ensure hassle free processing of our pharmaceutical formulations. It is equipped with all the requisite machines and tools, which allow us to utilize the resources efficiently. Audit to the in process checks to finished product inspections. Raw materials are accepted for manufacturing only after it is found to be of international grade by in-house & independent laboratories. Finished products are sent into the market, only on approval of QA department. Samples of each & every batch are retained for tests, while the products are in the market, for the entire period of its shelf life. We are an FDA, WHO and GMP certified organization; thus we ensure that we deliver quality pharmaceutical medicines for the treatment of various ailments to our clients. At our quality control department, we have a team of medical experts and scientists, which ensures that every stage, right from procurement of raw material such as API to dispatch of final tablets and formulations is closely scrutinized. 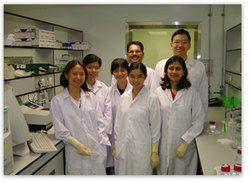 Our quality analysts conduct HPLC and GCLC tests before the final dispatch to ensure the effectivity of the medicines. Meet the quality levels established in the company in accordance with the QC100 Points of Quality. Encourage participation and teamwork for decision making. The achievement of these seven principles by Schwitz Biotech will foster improvement for clients, employees, suppliers and all of the other persons who make up the company.